This 3-D NASA satellite image shows a previous Saharan dust plume and how it flows westward. The most recent plumes have been farther to the north. HARLINGEN — This dust thing is starting to grate. The Texas coast and the Rio Grande Valley are going to continue to take a breezy battering coming at us from 7,000 miles away. Unusual atmospheric conditions known as Saharan dust plumes have been flowing across the Atlantic and Caribbean, and are wafting into South Texas and to a lesser degree over most of the rest of the state, too. The first one arrived in Texas on June 29, and others have followed. National Weather Service forecasters in Brownsville say another plume should arrive this weekend, creating hazy, brown-sky conditions and triggering allergy and asthma problems in people who are susceptible to airborne particulates. 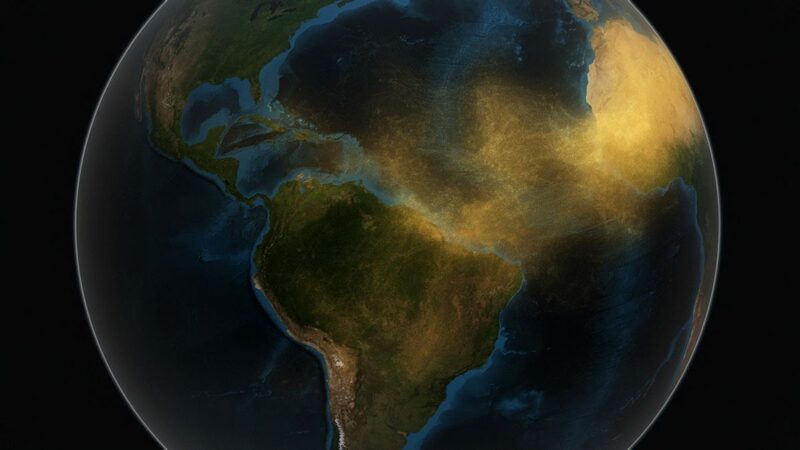 In fact, conditions are such that these African dust bands could be with us for at least the next two weeks. The plumes originate in the great Sahara desert of North Africa. The bands of dust currently besieging South Texas are not necessarily uncommon, but it is relatively rare for them to arrive here in such dense plumes. “Another fairly intense pulse of African dust is expected to arrive in South and Southeast Texas along the coast before pushing inland into parts of Central and Southeast Texas, with at least light amounts lingering in patches across the remainder of the state,” the Texas Commission on Environmental Quality reported Thursday in its air-quality forecast. Airborne particle pollution will be “moderate” in the Valley at least through Sunday, TCEQ said. Dr. William McKenna is an allergy and asthma specialist in Harlingen. Not surprisingly, he says some people here in the Valley are suffering symptoms linked to the dust. “It’s kind of the equivalent, if you will, to a poor-quality air day,” he said. “You can visibly see it being hazy if you’re looking into the air, particularly on a bad day. What that means is you have a lot of particles in the air, and for anybody who has respiratory symptoms or eye problems, they’re going to have a likelihood of increased symptoms. “And yes, we have seen that with a lot of our patients,” he added. Dust storms blowing out of the Sahara desert are not uncommon. What has changed this year is a set of unique atmospheric conditions has plopped down a high pressure system in the middle of the Atlantic Ocean. These dust plumes can’t be picked up on weather radar, but they do show up strongly on weather satellites. In this case, it’s the GOES-16. “It can see the differences in density and things like that, so it picks it up and we can tell when the plumes are coming in, when they’re going to start to fade and whether there are any more lined up in the Atlantic waiting to come through,” Straub said. Satellite imagery shows the high in the Atlantic directing the Saharan dust around its southern edge, creating a river of particles which are swinging below it and streaming straight through the Caribbean Sea into the Gulf of Mexico and then into Texas. McKenna’s theory is that the dust is so noticeable this summer in South Texas because of how the high pressure is shaping its movement and funneling it westward. “The other thing that’s kind of interesting along that line, and I think this is more of a meteorologist-type statement, but from what I understand typically the area of distribution of the dust is more of a wider area than it is right now,” he said. In the Valley in summer, most people keep an eye open for a lot more than dust. The hurricane season so far has been quiet, unlike last year. 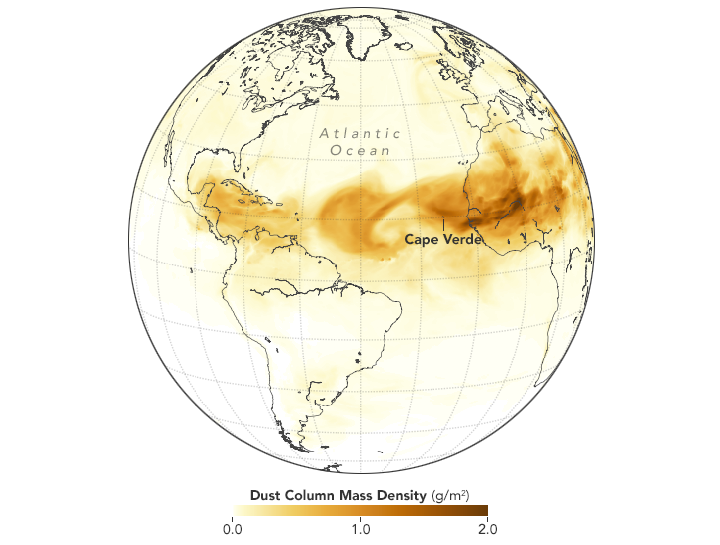 Some experts think the African dust storms over the Atlantic could be beneficial in tamping down, or at least delaying, the onset of peak hurricane season. Like McKenna’s patients, Straub said his own family has been affected by the Saharan dust plumes. McKenna said staying inside — which he wryly notes is not hard to accomplish in the middle of a Valley summer — is perhaps the best way to avoid respiratory problems from the dust. Sinus problems, he said, can be dealt with using nasal spray or antihistamines. But he said the dust particles can cause problems for anybody with respiratory issues.